Another bundle of data and insight from the crack Calcbench research team is now available: our latest survey of share repurchase programs. This report, which you can download on the Calcbench Research page, covers 25 quarters from 2012 through the first quarter of 2018 and analyzes more than 22,000 “firm quarter observations” — that is, every instance of a company repurchasing shares. For example, Apple repurchased shares in 19 of those 25 quarters, so it appears in the dataset 19 times. We found 1,481 observations of firms spending more than $500 million in a quarter on repurchases, and 701 observations larger than $1 billion. 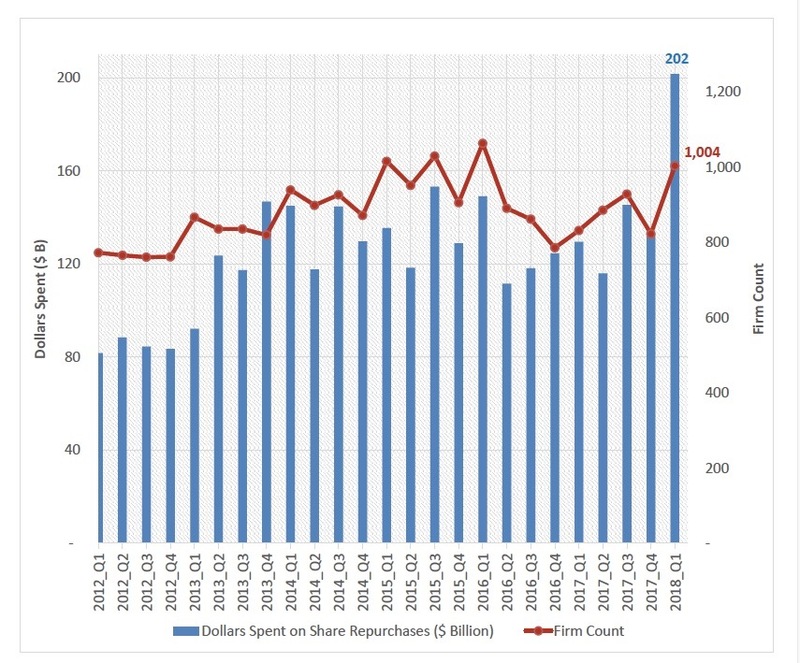 We call those observations “mega-buybacks.” Mega-buybacks accounted for only 3.2 percent of all observations we recorded, but 48.7 percent of all dollars spent on repurchases. As you may have seen in other news reports already, Corporate America went a bit nuts with share repurchase programs in first quarter 2018 thanks to last year’s tax reform— an all-time high in dollars spent on repurchases, and almost a record in number of companies engaging in repurchase programs. This chart below shows the spike. Our report also breaks down the number of buybacks sorted by dollar value; lists the biggest repurchasers of stock over the last 25 quarters; calculates dollars spent by the top 10 repurchasers in a quarter, as a percentage of all companies that quarter; calculates repurchase yields; compares repurchase spending to dividends spending; and much more. We update our repurchase report every quarter, so look for fresh numbers with Q2 2018 included sometime after Labor Day.